It you are a serious travel photographer, you’ll want to take a tripod with you when you set out on your next shoot. If you plan to fly, that has usually meant a large suitcase to pack your tripod in. For years, I used a tripod that was just slightly too large to fit in my carryon bag. No more. 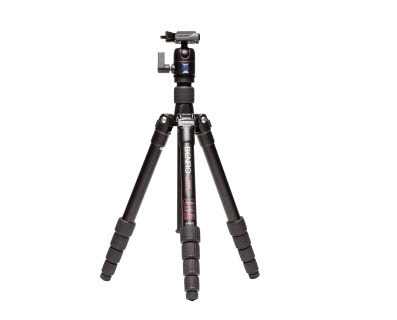 Last year I discovered the Benro Travel Angel TRCB269 tripod, just made for traveling, When folded, this tripod measures just 14.6” long – plenty short enough to fit in any carryon bag. Out in the field however, this baby opens to a comfortable 63.1” plus head height. It achieves its unusually short length by having the legs fold 180 degrees back onto the center shaft. This shaves lots of inches off the folded length, making it ideal to fit into a 22” carryon bag, even with the head attached. The legs have two separate stops enabling the tripod to set up extremely low to the ground or in cramped areas if needed. The center post comes equipped with a pull out hook which can be used for additional weight should you need to stabilize the unit even more. The rubber locking grips work very smoothly on the four leg extensions and help protect the legs from moisture and dust. The unit comes with a B-1 ball head which works splendidly with either large DSLR’s or medium format cameras. The B-1 comes with a quick disconnect camera plate and has worked admirably on a whole range of cameras and lenses including a Nikon D300S with a 300mm f2.8 lense. If you a looking for a great tripod in a compact format, you’ll have trouble finding anything better than a Benro in this size. Check out their website for all sorts of additional models.